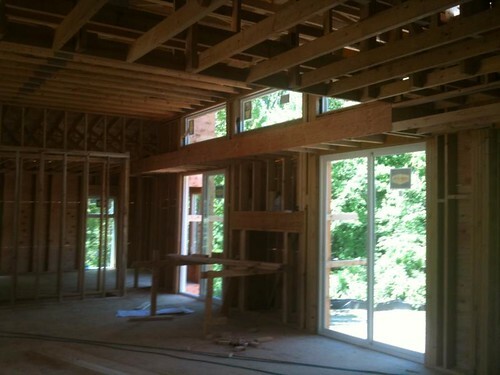 Windows and sliding doors have been installed, and a few more photos posted to the flickr set. They are using Weathersheilds Visions line - probably the best vinyl window on the market. Beware of flimsy vinyl windows from unknown brands. Plans for the two story version of this house design are available through our catalog page. Note, plans for this house design are a bargain. We offer house designs like this one which are not part of our other collectcions at a much lower price. Check it out.